Why would you as a human notice? You can move into air con. You're like the apocryphal "boiling frog". Other species are noticing. Plenty of interest in Tasmanian vineyards for example. Apparently, the cool climate wines are ripening two weeks earlier each year. Check my posting from the 13/12/2016. 40 years ago, it was just as hot and I had no A/C in my parent's house. I just refuse to drink the BS cordial being shoved down people's throat. Not quite as hot in the 70's though was it? So at best, this 'fast & massive' global warming is setting the same temperatures of around 35 years ago and still not broken the record of around 120 years ago. I wonder what our climate prophet, Tim Flannery's has to say about those stats?! I haven't read "fast & massive" in any IPCC report. Don't forget that our climate prophet/alarmist stated around 10 years that our dams would be dry within a couple of years and major cities would be dependent on desalination plants for water. Dillard then wasted tax payers money hiring the idiot as Climate commissioner. Fortunately, the subsequent government sacked him. This table is unfortunately 11 years old. Nevertheless, some of the highest averages are from the late 1800's. Thanks for the link cobran. It's difficult to get a clear picture from the raw data. This one from the BOM shows data from the Sydney Observatory and has the ability to highlight the stats according to long term averages (since 1859). The warming trend is pretty clear when you select 'median or more'. Good point. Since it is about Sydney specific, what I'd like to know is the effect of the ever growing concrete jungle on those temperatures. It is well know fact that concrete jungles increase local temperatures. Yes Urban heat islands will have localised effects. This article talks about the Western suburbs showing more pronounced warming in pockets due to UHI's. I suspect that the Sydney Observatory readings would suffer less from the UHI effect as it's surrounded by parkland, on a hill and subject to sea breezes etc. An easy way to eliminate the effect would be to check stations outside the urban areas. Its hard to find such stations with datasets as long as Sydney Observatory however I found Lake Burrunjuck near Canberra has data back to 1912 and Hobart (Battery point - which is not what I would refer to as a concrete jungle) that has data from 1881. Both show similar warming to Sydney Observatory. As Australia swelters and the northern hemisphere freeze, let's revisit what the scientific consensus was in 1969! So are you suggesting that a blogger with a Phd in bugs is a more credible source than the BOM? and why not as long as the two academics understand statistics to criticise what the BOM publishes? After all, they made Tim Flannery who is a mammalogist and palaeontologist, a guru on global warming who told us we were going to have no water in the dams by 2012! I'd like a public exchange of views between the BOM and the academics regarding how the stats are generated. That debate has already happened. She made her argument in the Australian back in 2010. She appeared on Q&A with Flannery. She had the BOM methods peer reviewed fact checked and then peer reviewed again. Each time the BOM were not only exonerated but praised for maintaining a dataset using world's best practice. MediaWatch did a piece on regarding her dubious Australian Environmental Foundation submission on the Murray Darling Basin water flows. Scientists with actual expertise in the ecology of Lake Alexandrina largely panned her opinions. The focus however was upon her lack of disclosure that the AEF was a front organisation for the IPA. The BOM publish their methodology for all to see. In spite of the reasons for starting the record at 1910 (due to the early data being unreliable) she persists in using it anyway. Our data on extreme temperature trends show that the warming trend across the whole of Australia looks bigger when you don’t homogenise the data than when you do. For example, the adjusted data set (the lower image below) shows a cooling trend over parts of northwest Australia, which isn’t seen in the raw data. 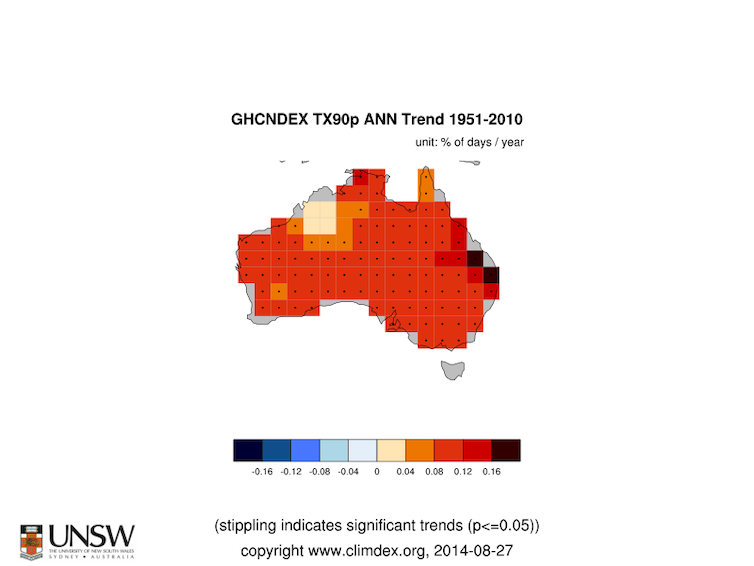 Trends in the frequency of hot days over Australia – unadjusted data using all temperature stations that have at least 40 years of record available for Australia from the GHCN-Daily data set. 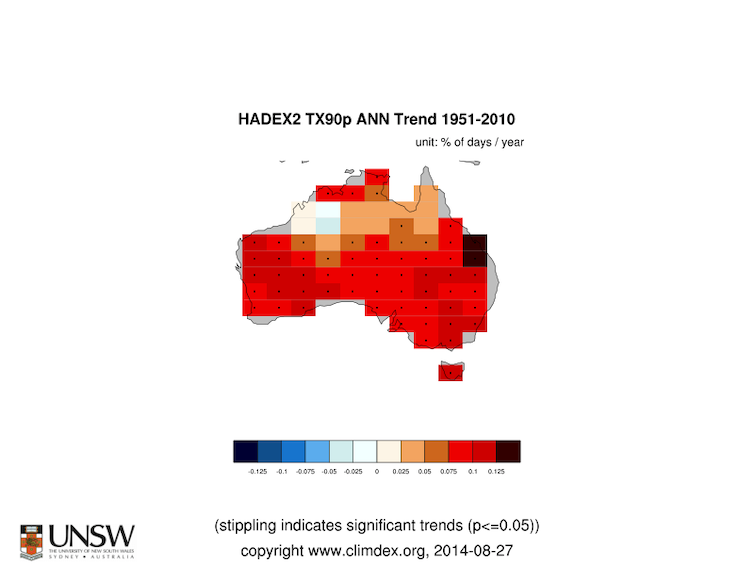 Trends in the frequency of hot days over Australia – adjusted ACORN-SAT data. The period of trend covers 1951-2010 when both datasets have overlapping data. All data used in figures are available from www.climdex.org. False. The poor quality of early data makes it impossible to conclude with confidence that 1896 was Australia’s hottest summer – the best available estimate is that it was considerably cooler than 2013. The pre-1910 data have not been “wiped from the record”. They are still available on the Bureau’s website, but are not included in the official record because they cannot be compared easily with modern data. So it is not conclusive that 1896 was cooler. Considering Armstrong has found temperature cycles to be around 300 years, a shame we don't have that much 'reliable' data on Australia. *Where in the f*ck does Armstrong get his data over multiples of 300 years? Armstrong found reliable data that meets cobrans standards, it doesn't matter where from. His models are proving better at predicting than mainstream ... Brexit, Trump, European elections next? The climate one will take longer prove true/false due to the amplitude of the cycle. You're asking me to drink the cordial on a major paradigm shift in energy generation, forced down by governments, where the proposed alternative is both more expensive and unreliable to society. History shows that changes in energy are not forced down people's throat but more naturally from technological innovation making the new alternative common sense to implement. The evidence is not 100% conclusive that any warming is man made, the alternatives like wind farms are an absolute eye sore and detrimental to local bird life ... and as the people of Adelaide found out, it is f@cking unreliable. When they overcome all those issues, I'll drink the cordial. I think you need to read his post from way back ... a bit more clearly. He always stated that Socrates predicted Brexit and Trump. He also clearly stated that his personal opinion was that it would be sabotaged. I'm sure you can figure out the difference between the two statements, unless your bias blinds you.